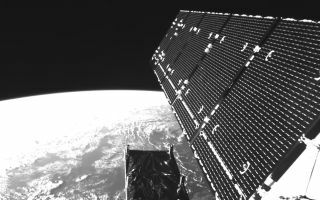 This space wallpaper was acquired by the satellite's onboard camera on 4 April, just hours after Sentinel-1A entered orbit on April 3, 2014. It shows the top side of one of two deployed solar array wings as well as part of the radar antenna. This space wallpaper was acquired by the satellite's onboard camera on 4 April, just hours after Sentinel-1A entered orbit on April 3, 2014. It shows the top side of one of two deployed solar array wings as well as part of the radar antenna. The solar wings and radar antenna opened together in a specific sequence that took around 10 hours to complete. As one of most critical stages in the life of the mission, it was choreographed by engineers on the ground and took place exactly as planned. This image was released April 4, 2014.